Unified Communications hardware | 8x8, Inc. The incredible power of cloud-based communications is changing the way we do business. Adding unified communications to sophisticated voice services has added another layer of effectiveness for call centers and small businesses. 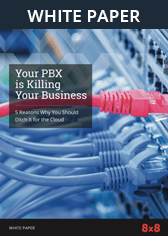 But unified communications require excellent hardware to deliver on the potential of the cloud, and companies need to spend some time making sure they get the right hardware in place for a good VoIP experience. Most business owners and managers understand that investing in cloud communications will save them money in the long term. They know that not having to run an on-premise hardware system and an IT department to manage it is a huge savings. Accessing software that automatically updates in the cloud, that scales easily and is quick to install makes a big difference to the bottom line. But there is an initial outlay on hardware required which can be daunting, and managers need to get it right first time so that their staff and call center employees can maximize the benefits of the cloud. One of the non-negotiables with your hardware should be sound quality. VoIP solutions can offer crystal-clear sound and reliability, whether you are using desk phones, cordless phones or IP conference phones. True “plug and play” functionality, along with powerful features and flexibility, come standard with desk phones like the Polycon VVX series. Be certain that the hardware you choose for desk phones offer full-duplex speakerphone with excellent voice clarity and delivery and LCD display screens. Additional features may include intercom, direct dial from a searchable corporate directory and Power over Ethernet (PoE) capability. Many companies like to let their employees roam freely throughout the workplace without losing connectivity. They should be able to deliver continuously reliable and available voice and data communications, both internally and with clients. Companies like Panasonic and Yealink offer excellent cordless devices with wall-mounted base units that plug seamlessly into your wi-fi network. Conferencing is the one area where poor quality hardware is really noticed and can have a material affect on a conversation. Quality is vital so that all parties can hear and partake in conversations around a conference table. Make sure you're choosing the optimal microphone pickup range for your boardroom and that there are power sources available to plug the unit in. If the investment in new hardware is too much for an organization to take on, they should investigate which companies offer the option of leasing phones on a monthly basis. Through the 8x8 Flex Rental Program, companies can rent the most popular and latest Internet Protocol (IP) phones instead of purchasing them upfront. These phones support 8x8 Virtual Office and the full suite of communications and collaboration capabilities. Rental products are brand new and include basic lobby phones, receptionist, Power-Over-Ethernet, Bluetooth, USB, Wi-Fi and conference phones to accommodate your business needs. New models are continually being added. When it comes to hardworking hardware in the office, you should consider taking some kind of insurance cover that will help you keep your phones in good working condition. So many things can go wrong with hardware that is used on a daily basis; from liquid spills to drops on a hard floor, water to power surge, lighting strikes to vandalism—it's worth making a contingency plan to cover those eventualities. At the end of the day, a new cloud engagement solution can help you arm your employees with the tools they need to communicate, collaborate and make use of the incredible possibilities that come with unified communications. But in order for that to happen, they need to be empowered with excellent hardware that is custom-built for the purpose, can facilitate what they do and can take advantage of the many benefits of cloud computing and VoIP.